Our customers asked for an herb tea sampler, here's what we've come up with: Choose any four of our fabulously fresh, delicious, nourishing and medicinal herb tea blends from the menu above...write your choices in the comments area of the order form. Your herb teas will arrive in a sturdy box and make a beautiful seasonal wellness gift for yourself or another. 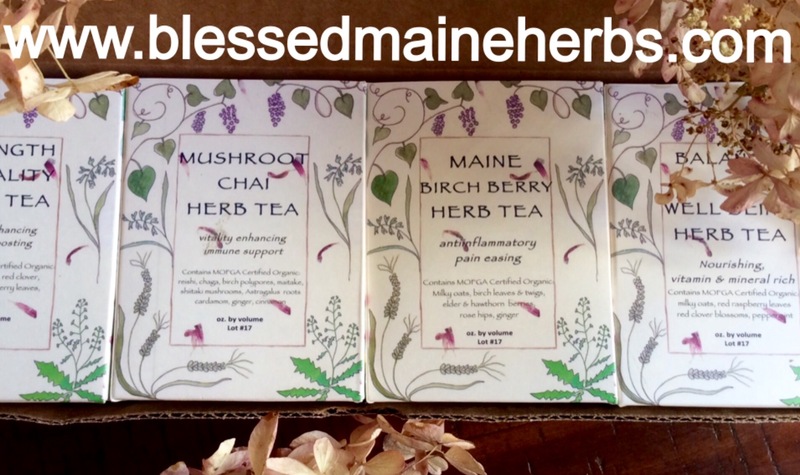 All the herbs in our artisanal tea blends are certified organic and the great majority of ingredients are lovingly hand grown or wildgathered right here on the Blessed Maine Herb Farm. All the herbs we're carefully processed here during September 2017. It doesn't get any fresher or higher quality than this. Our packaging is 100% recyclable and printed with eco inks. Each box contains 16oz of herb tea by volume - $50 includes shipping!